Ask Anyone Who Has to Use Sharepoint what they think of it. Ask anyone who has to use Sharepoint in their office what they think of it. If you are one of the people who has to use it, I’m sorry. Because unless your IT department has tons of money and a creative, open-minded leaning, then you are using “out-of-the-box” Sharepoint. And for you, I am sorry. It is confusing, ugly, and browser dependent. It is all that is wrong with the PC today and Microsoft for the last ten years. And that’s why a Microsoft Partner company can actually send an email like the one below. 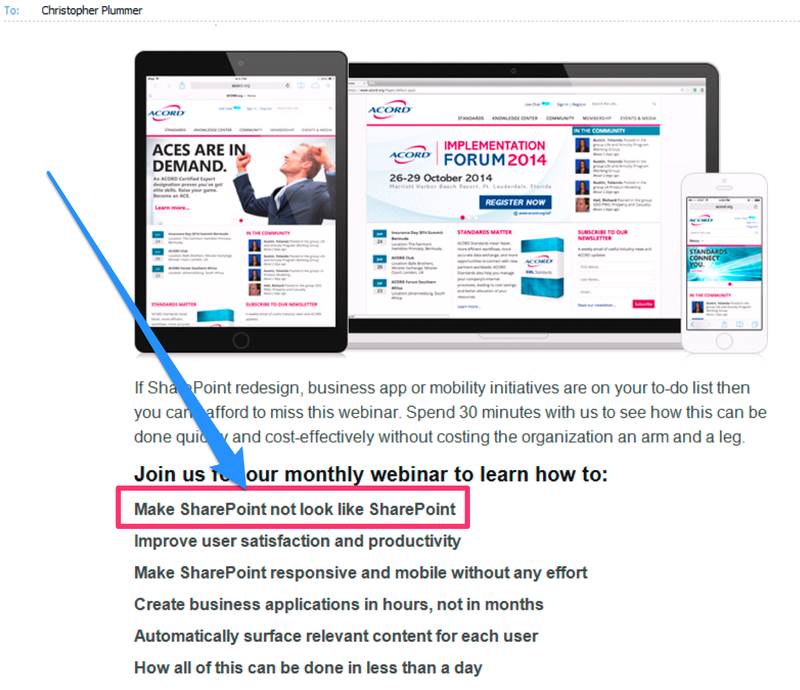 A product which can sell itself by making Sharepoint “not look like Sharepoint”. That says a lot doesn’t it? Am I taking crazy pills? If you are paying to make Sharepoint not be Sharepoint, why are you using Sharepoint?? This entry was posted in Analysis, Commentary, Humor and tagged Interface, Microsoft, Sharepoint, User Experience on July 31, 2014 by christoplummer.